Grains include many staples we know today such as wheat, barley, rye, oats, millet, rice, and sorghum. All of these grains have the same anatomy as in the picture to the left. This one in particular is the anatomy of a whole wheat kernel. The bran is the outer covering that contains vitamins, minerals, proteins, and antinutrients (which we will talk about). The bran was designed to keep predators away. 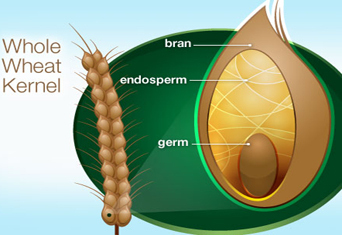 The endosperm is the energy supply of the kernel. The germ is where reproduction takes place. One of the many problems with grains today is that they are refined grains. This means that the outer bran and the germ have been removed leaving behind no nutrition. Scientists have figured out ways to “fortify” these refined grains by adding back nutrients, but the reality is that they come no where close to the real thing. You will find most of these refined grains in junk food, or processed food. “But, what about whole grains!” With whole grains the bran and germ are still intact, which means they do supply the vitamins, minerals, and fiber we need. The problem is that they come with other challenges such as proteins that are hard to digest, anti-nutrients that make the minerals in them unaccessible to the body, and they raise our blood sugar way too quickly. We will talk about all of these in more detail, stay with me. I say all this to say that when you compare grains (even whole grains) to other vegetables and fruits, grains do not come out the winner if talking about nutrient density! Remember that the more nutrient dense a food is the more bang you get for your buck in terms of actual nutrition. We discussed nutrient density more in this post and said that nutrition is supposed to be about nourishment, and nourishment on a cellular level. We can do SO MUCH BETTER by simply eating vegetables and fruits for our carbohydrates instead of grains. Grains are energy-rich but nutrient-poor. Diane Sanfilippo, of Balanced Bites, has created a beautiful guide to the nutrient density of good carbohydrate sources. By replacing your grains with vegetables and fruits you will get a more concentrated supply of valuable nutrients such as vitamins, minerals, fiber, and phytonutrients. Chronically elevated blood glucose levels are highly damaging to many body systems, including the liver, pancreas, kidneys, blood vessels, brain, and peripheral nerves. Managing blood sugar is critical for long-term health. Did you know that whole wheat bread and white bread have essentially the same impact on blood sugar? Pure sugar has a glycemic index of 100. White bread has a glycemic index of 73, and whole wheat bread has a glycemic index of 71. Why is it that the government is telling us to eat 6-9 ish servings of grains a day? Makes you realize that the message obviously plays into our obesity and diabetes epidemic. Phytic Acid (phytate) is the main anti-nutrient we find in grains. This compound’s role is to store Phosphorous in the plant tissues. The problem is that phytates block the absorption of minerals such as zinc, iron, magnesium, and calcium. The USDA points out here that grains are healthy because from them you get iron and magnesium. You do, but you don’t. These minerals never make it into your blood stream because they do not get absorbed. If a person eats a diet mostly made up of grains they are more than likely deficient in these minerals. Some mineral deficiencies are associated with skin problems, PMS, fatigue, anemia, and poor immunity to name a few. Lectins are subtances that are highly resistant in the gastrointestinal tract. They do not get broken down in the digestive process and instead bind to receptors in the intestine and are transported intact through the intestinal lining, which leads to issues like leaky gut. Leaky gut is where toxins and food particles leak out into the bloodstream instead of staying inside of the gastrointestinal tract as designed to. When this happens as explained in this post our immune system goes into overdrive and begins to attack us because they view these as invaders. Gluten is one of the biggest offenders we are finding out. Gluten is a protein that contains prolamin and glutein. It is found in certain grains (includes wheat, barley, and rye, etc). The other non-gluten grains (rice, corn, buckwheat, quinoa, millet) can also be troublesome as they have similar proteins that can cause problems. Read about those here and here. Gluten is very difficult to digest, and sometimes there are no obvious symptoms. Over time the digestive system can no longer compensate and you will begin to see autoimmune disorders, allergies, digestive issues, and for some celiacs disease. The diet prescription in celiac’s disease is 100% avoidance of gluten at all costs. I want to drive this home though, even in individuals who do not have severe gluten intolerance research has found that the majority of people still have gut inflammation after consuming wheat gluten. Know this: modern grain consumption can disrupt the health and well being in virtually all people, especially when consumed in excessive quantity! A no-grain diet can help to heal digestion, aid in losing weight, reduce inflammation, lower blood pressure, aid in clearing the skin, increase fertility, improve energy levels, and lower the risk of obesity, cancer, heart disease, and diabetes. Could you stop eating grains? Can you eliminate them completely for 30 days, record how you feel and any changes you find in your health, then report back? I believe you may be pleasantly surprised. Can you at least start by eliminating all gluten grains for 30 days? We just simply ask you to consider it and do your own personal experiment. From there the decision is yours! Thanks for today’s post! If I was to try eliminating grains for 30 days, do you have a post that guides what TO eat instead of what NOT to eat? Would love to try it! Aww that is wonderful! We do not have a post but here are wonderful guides we would recommend! I experienced SO many health benefits when I cut out grains 3+ years ago. Unfortunately it was part of a raw vegan diet… so I didn’t achieve optimal health. But now on a Paleo diet I have recognized cutting out grains and legumes was so important for my digestion and hormones! Great information here! Do you have a good beginner cookbook you recommend? I’m in school full time and it’s hard to find time to cook which is the main reason I haven’t tried grain free. I’d love to give it a shot though! want to ask what about the studies shows that grains reduce the risk of heart disease? how do u defend them? then I eat Bulgar freekeh and other grain and they are really make me full and never feel sugar rush? and phytates is also in spinach and kale right?